These logistics do not always take place in this form. Market practices have formed that are more abstract and logistically easier to deal with. Securities in physical form for instance, have been safeguarded in vaults of custodians and the seller and buyer in a transaction could then agree to have the custodian’s bookkeeping altered to indicate the buyer as new claimant. With securities in registered or dematerialized or uncertified form, it is for instance not unusual that a nominee or trust is recorded as the owner, but that this nominee or trust acts for a beneficiary owner – and if that beneficiary owner changes following a sales transaction then it can happen through a bookkeeping operation in the books of the nominee or trust. Securities settlement mostly takes places through such bookkeeping “systems” nowadays. Those bookkeeping securities systems are often automated these days. In Europe, there is specific legislation that regulates securities settlement systems (SSS). Also, less and less securities exist in physical form. More and more securities exist in registered form; and certainly more and more in dematerialized or uncertified form – these then only exist in the register of a central institution: a Central Securities Depository (CSDs). In Europe, there is also specific legislation that regulates CSDs. CSDs also often operate an automated securities settlement systems. CSDs and SSS rarely accept that end users (end investors) can directly alter the bookkeeping recordings that indicates ownership of securities. In most cases, only securities firms can be a participant or member of a CSDs or SSS. This securities firm might or might not act as nominee or trust, dependant on the market practices. Anyway, when the ownership over a bookkeeping security (security in CSDs or settled through SSS) changes, then the investor can instruct this change to the securities firm. The securities firm can then instruct the CSD or SSS about the alteration (when the new owner is not a client of the same securities firm, then this step may be skipped in some cases). For issuers, some CSDs allow that issuers register new securities issues directly with them. For other CSDs, issuers need to be represented by an agent that is recognised to deal with the CSD (an “issuer agent”). Their are CSDs that mainly make money from issuers, while there are other CSDs that mainly make money from the securities firms through which investors can exercise ownership in those securities. Most CSDs have a fee model that charges both actors however. Contrary to the United States, where there is only one Central Securities Depository and where the whole market thus has access to the same depository for settlement purposes, there is a huge amount of fragmentation in European Central Securities Depositories (CSDs) landscape. This is a problem, as being a participant of one CSD is often a costly thing. Being participant of all CSDs is borderline impossible cost-wise, but possible also regulatory wise (some CSDs do not allow any foreign firm to become a participant). 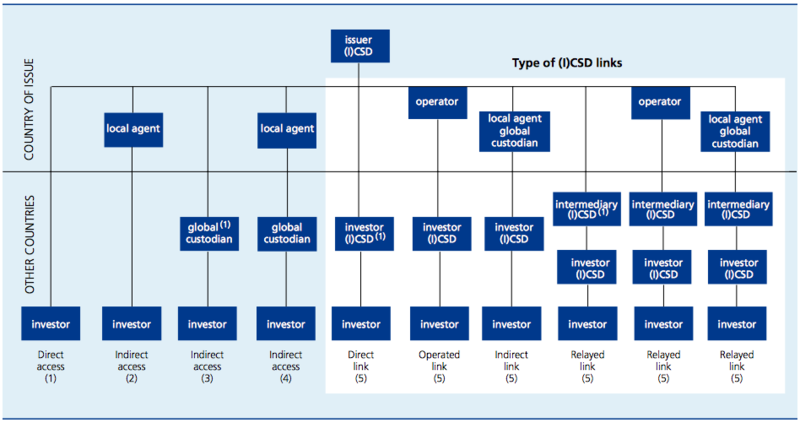 The custodian or account operator (participating securities firms may have different rights and names depending on the market practice around a CSDs) that an investor uses thus has to either be/become participant in another CSD, has to rely on the services of another custodian or account operator that does participate in the other CSD or has to rely on the domestic CSD that has a link with the other CSD. Also, any of those ways to access the foreign CSD may require to set up new relationships for the investor’s custodian or sub-custodian (which will be prohibitively costly if a too small pool of clients will use it), or may require the investor’s custodian or account operator to pay for custodian or account operator services himself. This thus adds a layer of costs. A similar problem may exist on the level of the cash leg, to pay for the securities settlement leg. Some SSS or CSDs require that a securities settlemen is accompanied with the simultaneous cash settlement. In fact, they organize the simultaneousness. But a requirement is then often that the funds should be made available in central bank money – thus in an account wiht the central bank of a specific country. This means that one needs to be a bank that participates in the central bank of a specific coutnry, or at least one needs the services of such settlement bank, to act as agent. The high cost of cross border settlement has always been recognized as a problem for the European Union. Many attempts were made in the past to address this. The CSD industry attempted to engage themselves to increase the number of links, but the cost implications never led to a situation that every CSD in Europe would be connected to every other CSD. Some individual CSDs attempted to create a common platform between them to easily interface with the other participating CSDs of that common platform (this effort was called Up Link Markets). Some CSDs wanted to consolidate the market through M&A activity (such as Euroclear, who controls the CSDs in the UK, Belgium, France, Sweden and The Netherlands). Some CSDs set up a CSD where participants would de facto be from all over the place and not just from one country – these are known as ICSDs (International CSDs): Euroclear Bank and Clearstream Bank Luxembourg. Also, some financial institutions would specialize in participating in many CSDs so that they can act as a subcustodian for other financial institutions in multiple countries, at relatively attractive rates. The most recent initiative came from the political level, as well as from the European Central Bank. The European Commission order the Giovanni group to research the problems with cross border settlement in the European Union, and this resulted in two reports:The first report:[google-drive-embed url=”https://drive.google.com/a/debuysere.com/file/d/0B3x47x0vFMeiLVdVeTgybW1XLWs/preview?usp=drivesdk” title=”First Giovannini Report on Clearing & Settlement in the EU (2001).pdf” icon=”https://ssl.gstatic.com/docs/doclist/images/icon_12_pdf_list.png” width=”100%” height=”1100″ style=”embed”] Second report:[google-drive-embed url=”https://drive.google.com/a/debuysere.com/file/d/0B3x47x0vFMeiOTAzbjl2bmh1ajA/preview?usp=drivesdk” title=”second_giovannini_report_en.pdf” icon=”https://ssl.gstatic.com/docs/doclist/images/icon_12_pdf_list.png” width=”100%” height=”1100″ style=”embed”] Many years would still go over it, but in 2015, both a Regulation from the European Commission entered into force which harmonizes the market for Central Securities Depositories (the CSDR), and the first CSDs connected to a common technical platform that the European Central Bank provides to CSDs against a charge (the Target2Securities platform).The Target2Securities is a voluntary system (although the majority of European CSD’s join) and is a platform where participating CSDs need to hold their accounts. Since all CSDs then have their systems adapted to interface with the T2S’s standard interface, it means that it becomes very easy to offer links between participating CSDs as it merely means that they should have an account with the other CSDs; And those accounts are thus technically held in the T2S system which means that they can readily be accessed by the participating CSDs. Also the account structure is standardized in the T2S system.Naturally, most CSDs keep their existing legacy systems in place (as all their existing members/participants are connected to that! ), so that there is thus a form of syncing between the legacy system and the T2S system. Cash settlement agent: the entity whose assets or liabilities are used to settle the payment obligations arising from funds transfer systems or from securities transfers within a central securities depository (CSD). Commercial banks and central banks are typical cash settlement agents. International central securities depository (ICSD): a central securities depository (CSD) which was originally set up to settle Eurobond trades and is now active also in the settlement of internationally traded securities from various domestic markets, typically across currency areas. At present, there are two ICSDs located in EU countries: Clearstream Banking in Luxembourg and Euroclear Bank in Belgium. TARGET2-Securities (T2S): the Eurosystem’s single technical platform enabling central securities depositories (CSDs) and national central banks to provide core, borderless and neutral securities settlement services in central bank money in Europe.